Before we can elevate organisational performance, we must stop making these 10 common mistakes. Ah, performance measurement. It’s one of the pillars of organisational success and one of the perils of organisational management. We all know how challenging it can be to get right, but often we’re not entirely sure why. Here are the 10 biggest mistakes most people make, when trying to manage organisational performance, but don’t even know they’re making. Skim through them here, and download the full white paper at the bottom of this article. Mistake #1: Rely just on financial statements. Profit and loss, revenue and expenses – these are measures of important things to a business. But they are information that is too little and too late. Too little in the sense that other results matter too, such as customer satisfaction, customer loyalty, customer advocacy. Too late in the sense that by the time you see bad results, the damage is already done. Wouldn’t it be better to know that profit was likely to fall before it fell, and in time to prevent it from falling? >> Use a system of non-financial performance measures to build a diagnostic tool that not only drives more profit, but other important business results too. Mistake #2: Look only at this month, last month, year to date. Most financial performance reports summarise your financial results in four values: 1) actual this month; 2) actual last month; 3) % variance between them; and 4) year to date. Even if you are measuring and monitoring non-financial results, you may still be using this format. It encourages you to react to % variances (differences between this month and last month) which suggest performance has declined – such as any % variation greater than 5 or 10 percent (usually arbitrarily set). >> Understand variation in a statistical sense, as the pattern of variability of a larger set of data. Not as the numeric difference between two data points. Mistake #3: Set goals without ways to measure and monitor them. This is not a measure at all – it is an activity. Measures are ongoing feedback of the degree to which something is happening. If this goal were measured well, the measure would be evidence of how much customer loyalty the organisation had, such as tracking repeat business from customers. How will you know if your goals, the changes you want to make in your organisation, are really happening, and that you are not wasting your valuable effort and money, without real feedback? >> Make sure your goals are clearly articulated first, then it’s much easier to find meaningful ways to measure them. Mistake #4: Use brainstorming (or other poor methods) to select measures. Brainstorming produces too much information and therefore too many measures, it rarely encourages a strong enough focus on the specific goal to be measured. Looking at available data means that important and valuable new data will never be identified and collected, and organisational improvement is constrained by the knowledge you already have. Adopting other organisations’ measures, or industry accepted measures, is like adopting their goals, and ignoring the unique strategic direction that sets your organisation apart from the pack. Wouldn’t you rather know that the measures you select are the most useful and feasible evidence of your organisation’s goals? >> Make sure you have a recipe for how a proper quantitative performance measure is constructed. Mistake #5: Rely on scorecard technology as the performance measure fix. You can (and maybe you did) spend millions of dollars on technology to solve your performance measurement problems. The business intelligence, data mining, analytics, dashboard and scorecard applications available today promise many things like “comprehensive business intelligence reporting, award-winning data visualization, and balanced scorecard and scorecarding” and “an information flow that transcends organizational silos, diverse computing platforms and niche tools… and delivers access to the insights that drive shareholder value”. Wow! But there’s a problem lurking in the shadows of these promises. You still need to be able to clearly articulate what you want to know, what you want to measure and what kinds of signals you need those measures to flag for you. The software is amazing at automating the reporting of the measures to you, but it just won’t do the thinking about what it should report to you. >> Developing a performance dashboard or scorecard is the seventh step, not the first step, in a proper performance measurement process. Mistake #6: Use tables and dials, instead of time series graphs, to report performance. Tables and gauges and dials encourage you to focus on individual points of data, which is the same as not seeing the forest for the trees. As a manager, you aren’t just managing performance today or this month. You are managing performance over the medium to long term. And the power to do that well comes from focusing on the patterns in your data, not the points of data themselves. Patterns like gradual changes over time, sudden shifts or abrupt changes through time, events that stand apart from the normal pattern of variation in performance. And graphs are the best way to display patterns. >> Use time series charts, or even better use XmR charts, to monitor each performance measure over time, to see true signals of change. 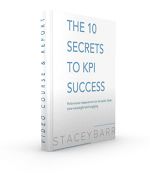 Mistake #7: Fail to use KPIs together, as an interrelated story about performance. A group of decision makers sit around the meeting room table and one by one they go over the performance measure results. They look at the result, decide if it is good or bad, agree on an action to take, then move on to the next measure. They might as well be having a series of independent discussions, one for each measure. Performance measures might track different parts of the organisation, but because organisations are systems made up of lots of different but very inter-related parts, the measures must be inter-related too. One measure cannot be improved without affecting or changing another area of the organisation. Without knowing how measures relate to one another and using this knowledge to interpret measure results, decision makers will fail to find the real, fundamental causes of performance results. >> Map the relationships between and among your goals and their performance measures, to make the story easier to see and tell. Mistake #8: Exclude staff from performance analysis and improvement. One of the main reasons that staff get cynical about collecting performance data is that they never see any value come from that data. Managers too often will sit in their meeting rooms and come up with measures they want and then delegate the job of bringing those measures to life to staff. Staff who weren’t involved in the discussion to design those measures, weren’t able to get a deeper understanding of why those measures matter, what they really mean, how they will be used, weren’t able to contribute their knowledge about the best types of data to use or the availability and integrity of the data required. And usually the same staff producing the measures don’t ever get to see how the managers use those measures and what decisions come from them. When people aren’t part of the design process of measures, they find it near impossible to feel a sense of ownership of the process to bring those measures to life. When people don’t get feedback about how the measures are used, they can do little more than believe they wasted their time and energy. >> Use Measures Teams, with members representative of their business unit, to develop and implement a set of measures for their business unit. Mistake #9: Continue to collect too much useless data, and keep delaying the collection of relevant data. Data collection is certainly a cost. If it isn’t consuming the time of people employed to get the work done, then its technological systems are consuming money. And data is also an asset, part of the structural foundation of organisational knowledge. But too many organisations haven’t made the link between the knowledge they need to have and the data they collect. They collect data because it has always been collected, or because other organisations collect the same data, or because it is easy to collect, of because someone once needed it for a one-off analysis and so they might as well keep collecting it in case it is needed again. They are overloaded with data, they don’t have the data they really need and they are exhausted and cannot cope with the idea of collecting any more data. Performance measures that are well designed are an essential part of streamlining the scope of data collected by your organisation, by linking the knowledge your organisation needs with the data it ought to be collecting. >> Don’t let a lack of data be the excuse for not measuring something. Design the measures that matter, then get the data for them. Mistake #10: Use performance measures to reward and punish people. One practice that a lot of organisations are still doing is using performance measures as the basis for rewarding and punishing people. They are failing to support culture of learning by not tolerating mistakes and focusing on failure. It is very rare that a single person can have complete control over any single area of performance. In organisations of more than 5 or 6 people, the results are undeniably a team’s product, not an individual’s product. When people are judged by performance measures, they will do what they can to reduce the risk to them of embarrassment, missing a promotion, being disciplined or even given the sack. They will modify or distort the data, they will report the measures in a way that shows a more favourable result (yes – you can lie with statistics), they will not learn about what really drives organisational performance and they will not know how to best invest the organisation’s resources to get the best improvements in performance. >> Let people use performance measures as a tool in their hand, to improve performance. Don’t use them as a rod for their backs, to punish or reward performance. These are bad KPI habits. Break them! Managing organisational performance is one of the most challenging aspects of leadership and management. People don’t take to performance measurement easily or readily, and there isn’t much guidance on how to do it well. But you can start to make organisational performance management easier, faster, more meaningful and engaging by stopping or avoiding these 10 common mistakes. >> Adopt a proper framework and approach for organisational performance measurement and management. One that avoids these mistakes and makes performance improve. One like PuMP. Linking KPIs to values and worldviews is our Aikido to redirect the opposing energy people put into resisting our KPI approaches. You might want to share this with your colleagues, to trigger discussion or as another way to get the message across that they need a better approach to measuring and managing organisational performance. Download the full white paper “Organisational Performance Mistakes” here.